Steven (Chicagoland, United States) on 19 August 2013 in Architecture and Portfolio. Excellent traitement, vraiment très original. Bonne journée. so beautiful composition, colors & treatment! Excellent , interesting processing ! Timeless beauty to the clean lines and angles of Wright's architecture. Inspired treatment you give it as well! Its a great treatment, a great treatment of a very nice shot. I like ! Beautiful shot and treatment, Steven! Nice share, Steven. Such a great work of art. Such a gorgeous house. I love all those windows to let in the natural light. Wonderful POV and I really like the colored pencil treatment! A beautiful house I would love to see. Your processing is fantastic! That is a very cool presentation. Excellent processing. It has the appearance of a highly detailed drawing. The look achieved on the people is fantastic. It brings me very good memories since I lived very close to this building. 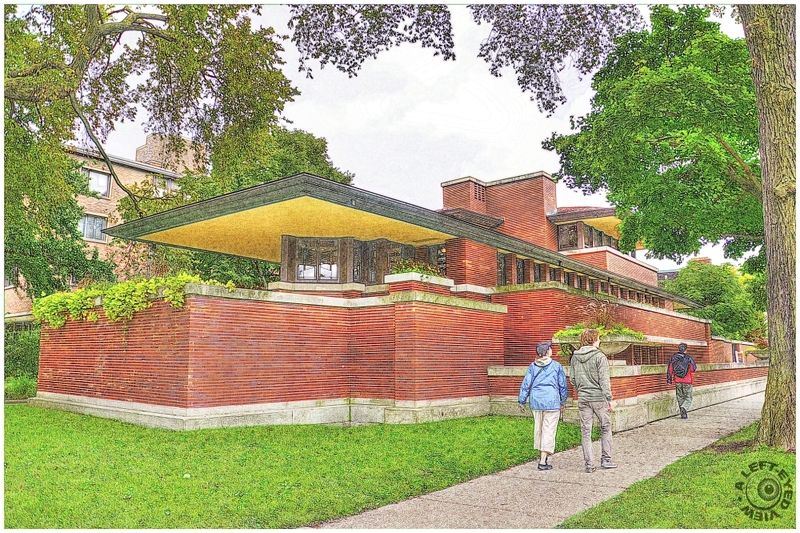 That is one very large home with FLW's distinctive style. Your pp treatment on it is wonderful.